I absolutely LOVE Christmas, Snow, Ice Skating and anything festive! Being an Aussie we don’t often get the opportunity to ice skate but since I have been living in the Northern Hemisphere I’ve had the chance to go three times and whilst I am never going to represent my country in the Olympics for ice skating, I do love it! I’m currently feeling very festive after a visit to Hyde Park’s Winter Wonderland here in London and our recent trip to the stunning Swiss Alps where I fell more and more in love with snow & mountains! I find snow and ice skating so magical and wanted to share 10 of the most magical ice skating rinks around the world! In winter, a 7.8km section of the Rideau Canal in Ottawa turns into the world’s largest ice skating rink, being the size of over 90 Olympic ice hockey rinks! 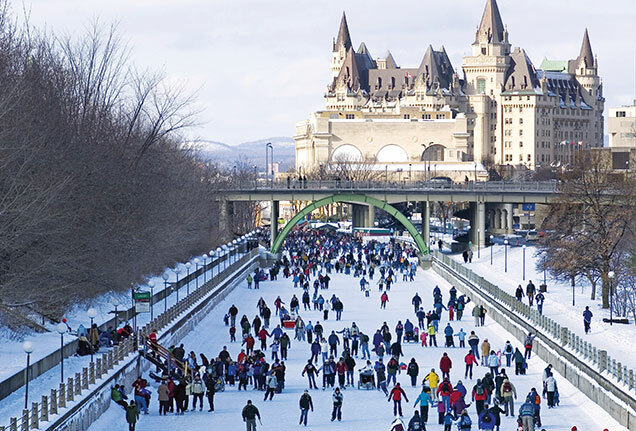 As well as being a popular tourist attraction, it is used by many locals to skate to work and is also the focus of the Winterlude festival in Ottawa where delicious food and drinks are sold in little shops along the canal! The skateway is free and is open 24 hours a day! It is surely a tradition that I would love to try one year! 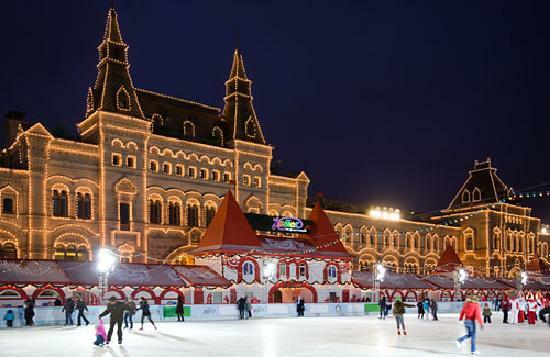 The largest ice skating rink in Russia is located in Moscow’s Red Square. The rink has warm dressing rooms along with a nearby Christmas fair. A beautiful 25 metre fir tree towers over the Red Square only adding to the festive mood! I can’t even count how many Christmas movies I have seen where the stars glide around the famous rink at the Rockefeller Centre. 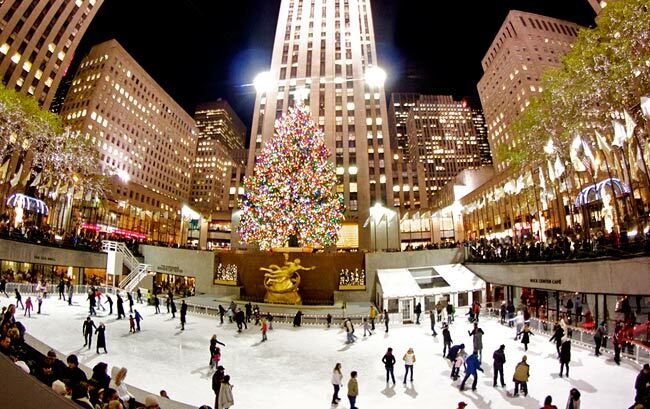 It is one of New York City’s most famous winter attractions and is located in the heart of the city. It is a true Christmas and New York City tradition to enjoy and one you will never forget! The canals no longer freeze over every year which makes it even more special when they do! Locals and tourists alike don skates and glide along the canals, past farms and windmills. I truly think it would be one of the most incredible ice skating experiences in the world! The natural ice rink on Lake Louise in Banff National Park would have to be one of the most stunning, scenic ice rinks in the world. Every year the sparking, glacial fed waters of Banff National Park freeze over provided one of the most incredible ice skating experiences in the world. It is also possible to play ice hockey on the lake as well as enjoy the large ice castle which is built on the lake every year in time for Christmas. I truly believe there would not be a more magical experience than gliding along the ice with the stunning background of Victoria Glacier and Banff National Park in the background! 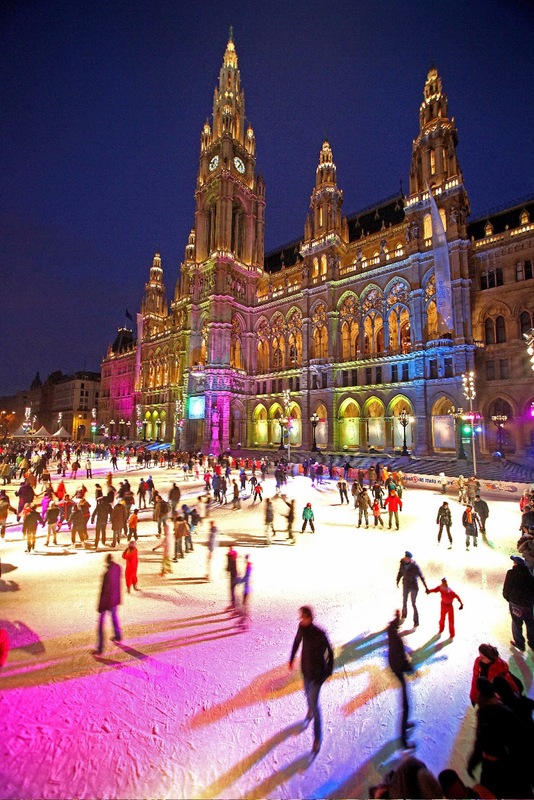 The City Hall Square of Vienna is transformed into a giant ice rink each winter. The illuminated facade of the beautiful City Hall forms the fairytale backdrop for Vienna Ice World. Throughout the day the music changes from sounds of Viennese waltz to popular hit music! The ice rink is enormous and becomes even more magical when lit up in a rainbow of colours! It was hard to narrow it down to only two ice rinks in New York City as they have so many famous and beautiful rinks, both natural and man made. The Wollman Rink is located in Central Park and boats a stunning panoramic view of the city skyline. 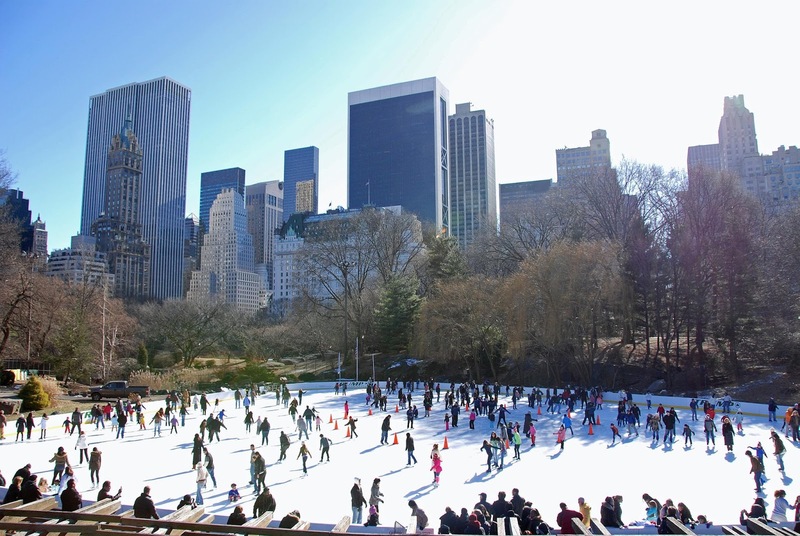 Central Park lakes have a tradition of ice skating dating all the way back to 1858! The Wollman Rink will be very familiar for romantics and fans of the film Serendipity! 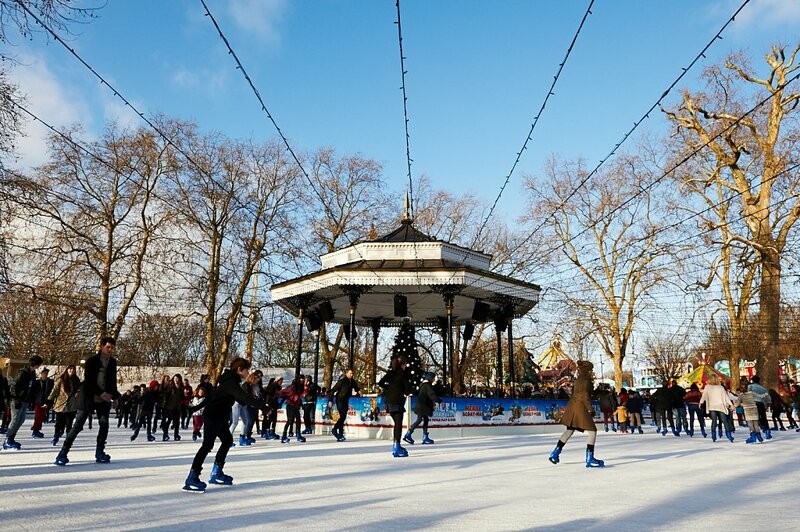 London is the home of many, many ice rinks and I couldn’t choose the best one as they all look amazing so I opted for the one that I have personally experienced, Winter Wonderland in Hyde Park! Winter Wonderland is a spectacular Christmas destination with rides, food, drink, festivities, entertainment, a magical ice kingdom, a wheel and of course, ice skating! The Ice Rink at Winter Wonderland is magical! It is set around the Victorian bandstand and is lit up with over 100,000 lights! It is very magical and we loved skating around the glittering ice rink in Hyde Park. 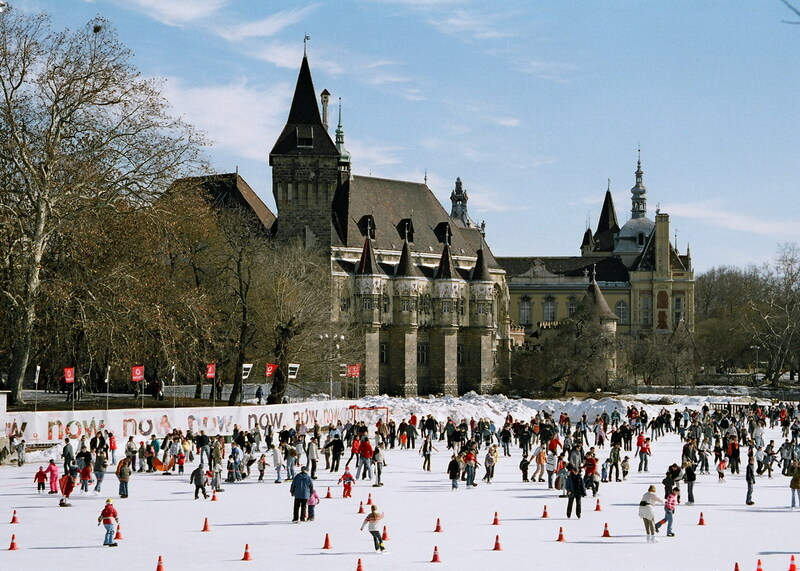 The enormous Ice Rink of Budapest which is located in City Park is listed as one of the top 10 Lonely Planet best places to visit in Europe in winter! The stunning boat lake from summer is turned into a popular venue for skating in winter! It is even more magical with the Vajdahunyad Castle in the background! Paris is well known to be one of the most magical cities in the world, and what is more romantic and magical that ice skating! 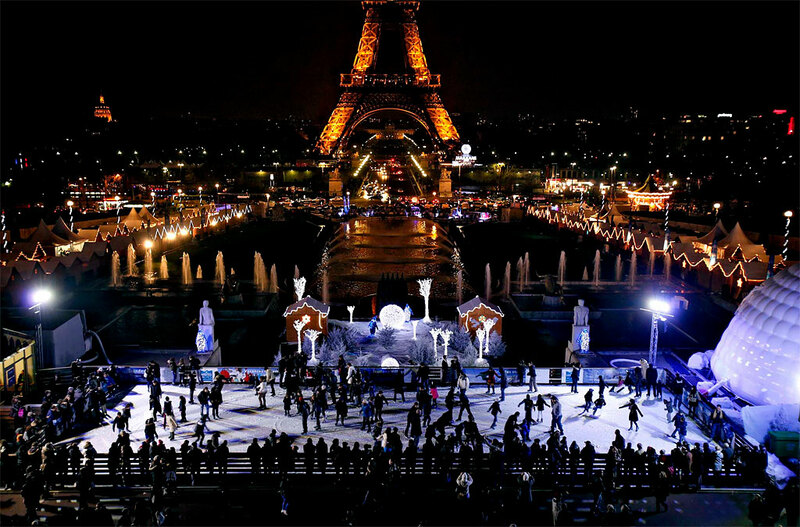 Many pop up ice skating rinks appear throughout the city in iconic spots such as the Eiffel Tower, on the Champs-Elysées or at of the Palais de Chaillot, facing the Eiffel Tower. Two of the most magical and famous are the Trocadero, which offers the best views of the Eiffel Tower and the Eiffel Tower Rink which is located on the first floor of the Eiffel Tower! What other magical ice rinks have you been lucky enough to visit?